Today’s Rosh Hashanah recipe of the day is from Melinda Strauss, the founder of Kitchen Tested, a website devoted to helping home chefs tackle any recipe (and where everything is kosher, too!). And we must say, this recipe for Apple Pecan Galette will make one nice looking dessert on your Rosh Hashanah table. I began with the silky homemade caramel so it would have a chance to cool while I worked on the dough and apple filling. In a pot, I combined the sugar, cream of tartar and water and set over medium-low heat to caramelize. I stirred constantly until the sugar was dissolved completely and the syrup was clear, around 5-8 minutes. To prevent crystallization, do not rush this step! When the sugar was fully dissolved, I raised the heat, brought the syrup to a boil and stopped stirring. Using a candy thermometer, I continued heating the sugar without stirring until 350 degrees F and a medium-dark amber color. I highly recommend using a thermometer! If you don’t feel like using one, just read my homemade taffy recipe and you might change your mind. I removed the pot from the heat and added the whipping cream then the margarine. Be careful because the mixture will sputter and foam at this point. When the mixture settled down, I stirred with a silicon spatula until smooth. I returned the pot to the stove and boiled until the mixture reached 248 degrees F, around 1 minute. I removed the pan from the heat, added the salt and vanilla and stirred. I let the caramel cool for 20 minutes, until warm but not too hot, and stirred in the peanut butter. While the caramel was cooling, I moved on to the galette dough, which is so simple you won’t believe it. In a food processor, I combined the flour, salt and sugar then pulsed in the margarine and shortening until the mixture looked like cornmeal. I added a small amount of ice water until the dough started to come together then I wrapped it, flattened in to a disk and refrigerated for 30 minutes. When the dough was almost ready, I thinly sliced up my apples (unpeeled for texture and extra flavor) and mixed in the sugar, flour and spices. I covered the apple mixture and set it aside. On a lightly floured piece of parchment paper, I rolled out the dough in to a 12-inch circle…well, almost a circle. 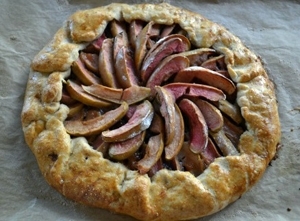 The great thing about a galette is that it doesn’t have to be perfect. I spread the salted peanut butter caramel over the center of the dough, leaving a 3-inch border. I sprinkled on the candied pecans then placed the apples over the top in a fan pattern. You can use whatever design appeals to you! I folded the dough over the apples and it really had a great rustic look. I slid the galette with the parchment paper on to a baking pan and brushed the exposed dough with a whisked egg thinned out with a bit of water. The galette baked for 50-55 minutes at 350 degrees, until the crust was a nice golden brown. If your crust is getting too dark during the baking process, you can cover the border with some foil. I let the galette cool a bit before taking the first taste and boy was it worth the wait! It was like biting into a sweet delicious caramel apple dipped in peanut butter and pecans. My fave! The apples kept their incredible color and flavor, the salted peanut butter caramel added a creamy silky texture and the candied pecans were the crunch-factor I was hoping for. If you don’t like pecans you can leave them out since the crust is perfectly crunchy as well, but I love the added sweetness and crunch from the candied nut. And if you think it’s too much effort to make the candied pecans to go along with the caramel, I say they are worth the effort because they freeze incredibly well and I use them all the time when I bake. Anytime a recipe says to use pecans, I use my homemade candied pecans. Yum! This recipe originally appeared on Kitchen Tested. Check out more Rosh Hashanah recipes here.